Membrane transport is mediated by membrane proteins. The function and expression of these proteins is regulated on several levels including transcription, translation, trafficking, protein modification and regulatory subunits. We investigate these regulatory mechanisms by a systemic approach, monitoring the functional consequences in vivo or directly ex vivo (cell culture, freshly isolated tissues) by Ussing chamber experiments and isolated perfused nephron segments. Tight junctions are sophisticated multi-protein units which determine the properties of the paracelluar pathway in epithelia. 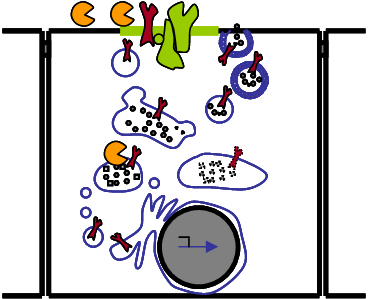 One major component are claudins, a large family of transmembrane proteins. 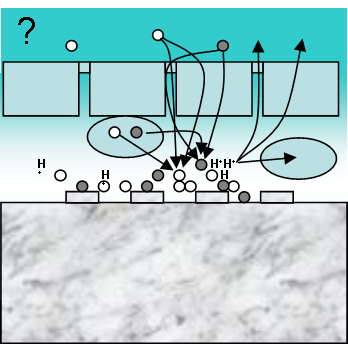 Claudins determine the tightness, selectivity and permeability of tight junctions. 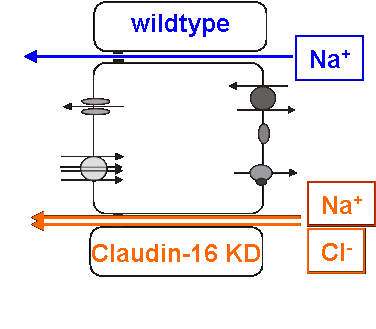 In kidney tubules, for example, claudin-16 is mainly located in the thick ascending limb of Henle (TAL). 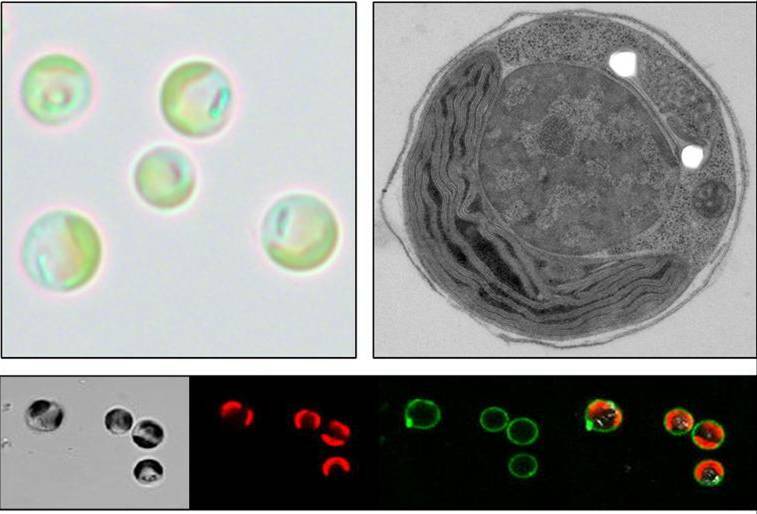 Mutations in claudin-16 gene are linked to familial hypomagnesemia with hypercalciuria and nephrocalcinosis (FHHNC), a human disease with severe renal Mg2+ and Ca2+ wasting. 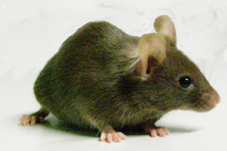 We investigate the properties of claudins in transgenic mouse models in vivo and ex vivo in isolated perfused tubular segments. 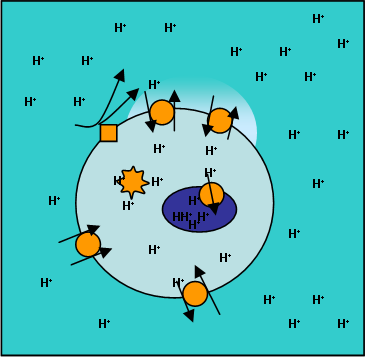 For many organisms it is crucial to keep intracellular pH in a very narrow range. 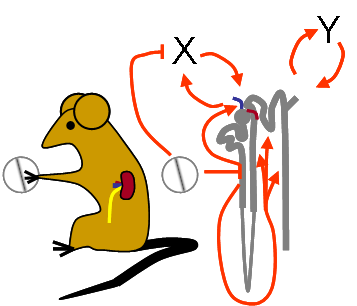 In addition mammals have to provide and control their own extracellular milieu. 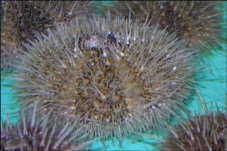 Many marine organisms depend on the composition and pH of seawater as their unlimited extracellular space. In mammals we are mainly interested in acid/base homeostasis performed by the kidney. Different segments of the nephron thereby display different archetypical H+ or bicarbonate transport mechanisms and a great variety of regulatory, compensatory and pharmacological potentials. Marine species, especially single cell organisms and freely swimming larval states, are exposed to the infinite extracellular space of the ocean. The massive anthropogenic generation of CO2 lowers the pH in their habitat and challenges acid base balance and calcification. We characterize the respective mechanisms several marine model organisms (coccolithophorids, sea urchins, corals and mussels). 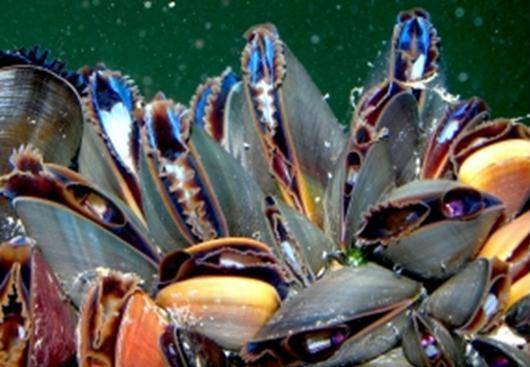 A multidisciplinary network of scientist within the cluster of excellence “the future ocean” provides an ideal background for translational perspectives from man to marine organisms and vice versa. Many pharmacological substances interfere with epithelial transport, either as main effect or as undesirable side effect. In both cases a detailed knowledge on the respective target mechanisms and possible compensatory actions is a prerequisite to perform a safe pharmacotherapy in man. We investigate these mechanisms on the cellular and isolated tissue level. We analyze the systemic role of distinct epithelial transport mechanisms in animal models and translate these results into the clinical context.